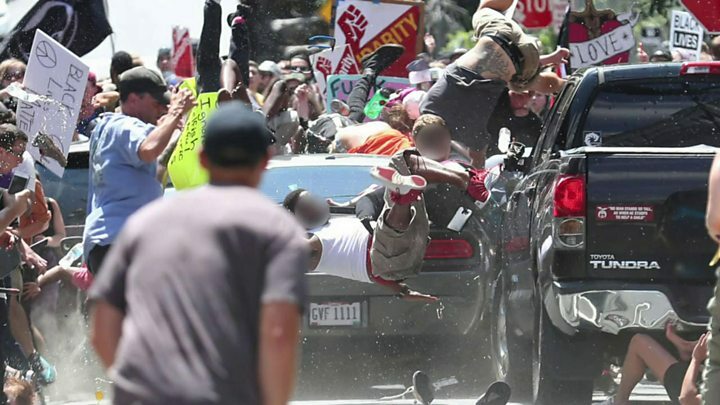 A 20-year-old man accused of ramming his car into a crowd of protesters at a white nationalist rally in Virginia has appeared in court via video from jail. James Alex Fields was denied bail as he was arraigned for second-degree murder, three counts of malicious wounding and one count of hit and run. 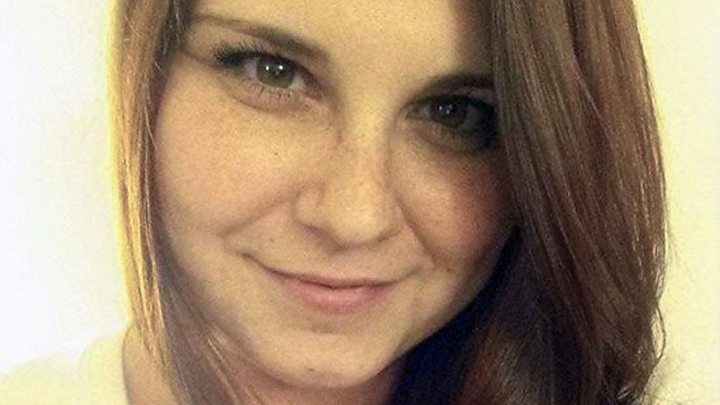 Heather Heyer, 32, died and 19 were injured when a car hit demonstrators in Charlottesville on Saturday. President Donald Trump has been criticised for not specifically denouncing the far-right elements in the weekend's march. 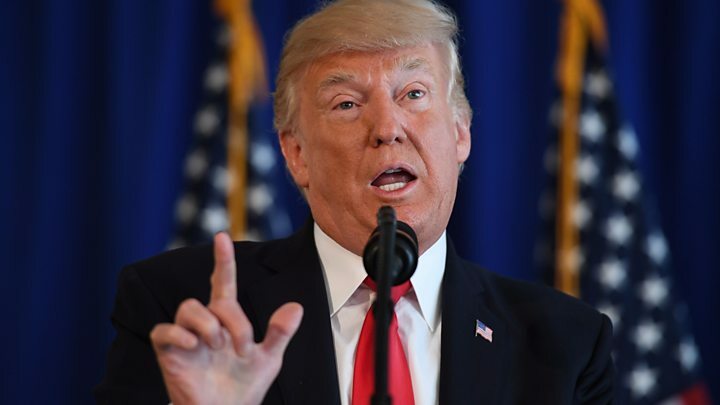 But the White House has defended his remarks as explicitly condemning the white supremacy groups involved. Ken Frazier, CEO of drugs giant Merck, announced on Monday he would resign from the president's American Manufacturing Council over Mr Trump's response to Charlottesville. Mr Frazier, who is African American, tweeted he had "a responsibility to take a stand against intolerance and extremism". James Alex Fields looked nervous and listless on the small monitor in the corner of the courtroom. Mostly he kept his head down, his eyes darting occasionally up towards the camera. He was wearing a striped jumpsuit and had the neat, buzzcut hairstyle favoured by many white supremacists and neo-nazis who have united under the banner of the so-called "alt-right". Judge Robert Downer read his charges - one count of murder, one count of hit and run, three counts of malicious wounding. Alex Fields spoke briefly to say he was employed by Securitas and Omni Ohio, could not afford a lawyer, and had no ties to Charlottesville. Judge Robert Downer denied him bail, and revealed he could not be appointed a public defender because someone in the public defender's office was directly affected by the crime. His appointed lawyer, Charles Webster, named in court by the judge, had yet to be contacted to inform him of his latest client. In 10 minutes it was over. Outside the court, known white nationalist Matthew Heimbach was shouting that the death of Heather Heyer was the fault of the police. "Nazis go home," the crowd chanted back at him. 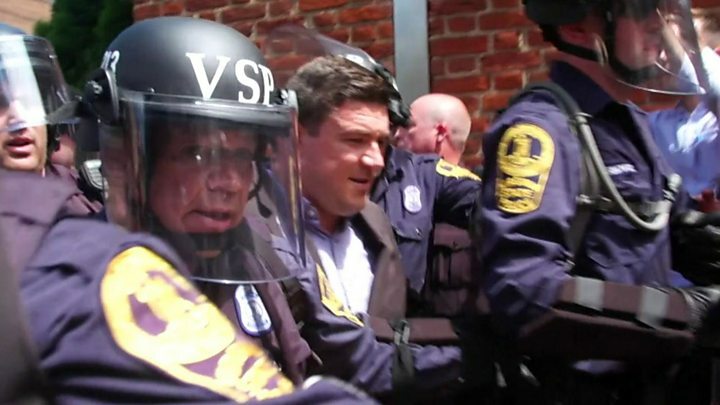 "I think I like it in Charlottesville," he said. "I think I'll stay." Attorney General Jeff Sessions on Monday said the deadly violence met "the definition of domestic terrorism", adding that the Justice Department was opening a civil rights investigation into the event. "You can be sure we will charge and advance the investigation towards the most serious charges that can be brought because this is unequivocally an unacceptable evil attack," he said on ABC News' Good Morning America. He told the television programme that FBI agents from the terrorism and civil rights divisions were also investigating the matter. 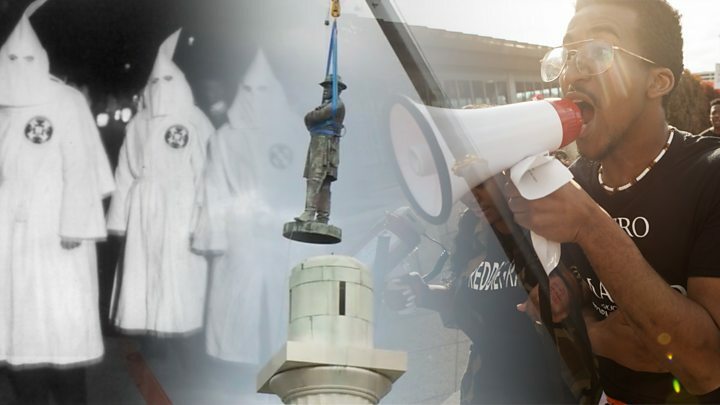 Hundreds of white nationalists convened in Charlottesville on Saturday to protest against the removal of a statue of a general who had fought for the pro-slavery Confederacy during the US Civil War. Media captionMarissa Blair, friend of Heather Heyer: "It was an act of terror"
Protests and vigils in support of Charlottesville were held in many US cities on Sunday. In Seattle, police used pepper spray to stop protesters approaching a pro-Trump rally. Are right-wing groups on the rise? How did Trump initially respond? Hours after the violence erupted, Mr Trump said he condemned "in the strongest possible terms this egregious display of hatred, bigotry, and violence on many sides". "The hate and the division must stop right now," he told reporters in New Jersey, where he is on a working holiday. "We have to come together as Americans with love for our nation." 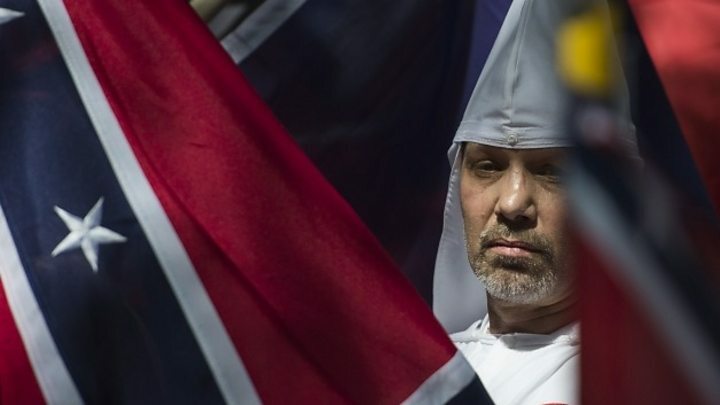 But his comments did not explicitly condemn the white extremist groups involved in the rally, an omission that was strongly criticised by Republicans and Democrats alike. Many, including senators Marco Rubio and Ted Cruz, echoed the sentiment of Colorado Senator Cory Gardner, who tweeted: "Mr President - we must call evil by its name. These were white supremacists and this was domestic terrorism." The president's national security adviser, HR McMaster, went further by commenting: "Anytime that you commit an attack against people to incite fear, it meets the definition of terrorism." The mayor of Charlottesville, Democrat Mike Signer, drew a link between the events and the rhetoric of Mr Trump's 2016 presidential campaign, saying that "these anti-Semites, racists, Aryans, neo-Nazis, KKK" had come out of the shadows after having "been given a key and a reason to come into the light". In response to the criticism, the White House issued a statement on Sunday clarifying that Mr Trump's condemnation had included white supremacists. "The president said very strongly in his statement yesterday that he condemns all forms of violence, bigotry and hatred. Of course that includes white supremacists, KKK, neo-Nazi and all extremist groups," a spokesperson said. Mr Sessions also came to the president's defence on Monday, saying he "explicitly condemned the kind of ideology behind these movements of Nazism, white supremacy, the KKK." That is his unequivocal position," Mr Sessions said, "He totally opposes those kind of values".